I am afraid of rats. I don’t really know why, but those grey four-legged creatures evoke in me, as in many others, an unexplainable aversion. It may be their ability to pop out from nowhere, taking over my home as if it were their own; it may be their scavenging tendency which results in their turning up in people's belongings; it may be the dirt and nibbling marks which they leave in their wake; or it may be their craving for food scraps. Perhaps it is the fact that they live in sewers or in the trash, or perhaps it is the thought of the diseases they may transmit … I don’t know, but the fact is that even cockroaches disgust me less than mice or rats. I know how to cope with cockroaches: I can call a pest control company, I can throw a shoe at them, or just let them go back to where they came from. But I simply cannot cope with the knowledge that there is a mouse in the house. And this is why, when I found a rat in my garage, there was no way I was going to let it live. This was no regular rat, the kind you may find in pet shops, or even one of those small ones not uncommon in private homes. It was a relatively big grey rat, and it was standing on its two hind legs waving its two front paws. Rather like a cartoon rat but without the charm added in the movies. The rat in my garage had the look of a street rat. It might have been posing like a cartoon rat, but it possessed humanlike character and courage. In addition to bicycles and building materials, on one wall of our garage are long shelves with various odds and ends which do not fit inside the house but have not yet been relegated to the local dump. The moment I spied a suspicious movement along the floor of this wall, I froze as if I had seen a ghost. There could be no doubt. A quick, grey, elusive, rustling movement followed by silence. I waited. I could go inside the house, lock the door, kid myself that I had imagined it all and that it was only my fear testing my limits, and hope that this thing would stay outside and maybe even find another home. But no, I decided that I had to make sure that it really was what I thought it was and to stand strong and demand that this creature leave my property without further delay. Shuddering, I walked closer to the place where I had first seen movement. The rat, realizing I had no intention of carrying on with my day, came out of its hiding place and stood before me, towering at a height of about 30 cm. A brave rat, I thought to myself. What exactly is it thinking, confronting me like that? But it stood there, a defiant, somewhat threatening look in its eyes, preparing for potential conflict. And as we were watching one another, the rat crossed its paws over its chest, as if getting ready for a debate. But the rat's humanlike appearance did not make it any more likeable. Its very presence was unbearable and I had no choice but to declare war. I charged in an attempt to catch it, but the rat was very quick: one moment standing in front of me, the next somewhere else, waiting in a relaxed pose, moving its right leg as if amused yet bored by my growing anger and futile efforts. After a few attempts, defeated, desperate and exhausted, I was left with no recourse but to try and wake up from this bad dream. Have I reached a place where emotional exposure scares me to the point that I imagine rats coming out of a hole and visiting my home? Am I afraid to reach certain subconscious levels in my mind? Maybe. But I have come to believe that the rat in the garage represents my fears. 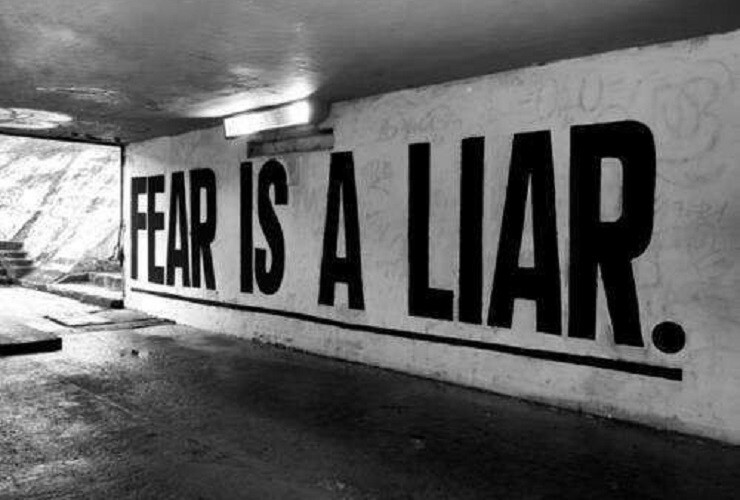 In recent years I have been motivated by fear rather than by dreams or desires. Fear runs my life, my every day, the decisions I make. I use risk management to cope with life, always wondering where the next blow might come from, building high defensive walls, avoiding unnecessary risks, choosing the easy way out and succumbing to my surroundings. The realization that I am managed by my fears was a revelation. I have been aware for a while now that my anxieties have taken over my thoughts, spreading throughout my body and manifesting themselves in the form of various aches and pains, like a small hole getting bigger and bigger, each time in a different place. I was also conscious that my body has been sending me distress signals which need to be addressed and resolved for the sake of my caged soul. And yet, as one who aspired to control her life as well as her pain, the realization that something as amorphous and subjective as fear could control me showed me that things had gotten out of hand and that my sense of being in control was deceptive. This is not about being controlled by a force majeure— by disease or any of the other surprises sprung on us by the Russian roulette of life. These are the types of surprises that I prepare myself for; at times getting ready for battle, at other times, calmly accepting and understanding that which we cannot control. Now I realize that the hand which grasps and controls my life is none other than a huge "rat" that lives inside me and knows me better than anyone else ever could. This "rat" is a reflection of myself or rather of the person I used to be: a brave and ambitious warrior, looking to overcome all obstacles, seeing each failure as a building block toward the next goal. Rats, like the child I was, are survivors. It is their fate. As long as I lived as a survivor, it was much easier to be a brave warrior. There was simply no other choice. It was always crystal clear: you were either a fighter or a loser. To rediscover my motivating power and to achieve my dreams as a bold, decisive, and strong woman while living in a supportive, comfortable and pampered environment requires inventing myself all over again. Not as a warrior but as a leader. Not as a survivor but as an entrepreneur. Will I overcome this challenge? Even now, walking through the garage, I glance towards the wall but this time with new acceptance that maybe the rat is really there. However, I now believe that as long as it stays inside the garage, I may be able to live in peace with its presence. This rat may know me, but I know it just as well. While I am still afraid of rats (perhaps just a little less now), the rat in the garage reminds me that we experience fear in order to prompt us to be brave, and that we must limit our fear to situations in which it protects us from the threats and not from the joys and potential pinnacles of our life.